As Christian women and men start planning for the purpose of their Daniel Fast, a common focus is relationships. Sadly, many people struggle with painful encounters with family, friends and coworkers. Recently, I’ve heard from many folks seeking advice and wisdom when their relationships are soured. Yes, we experience trials and sorrows in this life! And sometimes, those sorrows are from people very close to us. Heartache and sorrow can come from the unkind words of a spouse or a child. From the disrespect of a friend or a co-worker. From people we hold dear or people we are in contact frequently. So what do you do when you feel emotionally battered or treated poorly by those who “should” love and respect you? First, Jesus’s words tell us the best response . . . “have peace in Me.” When you are hurting, come to your Comforter. Find peace with Him. Rest in the assurance that He loves and cares for you. Second, pray for those who hurt you! Set aside any resentment or bitterness and instead pray for them. Ask God’s Holy Spirit to work in their hearts so they draw nearer to Him and walk in His ways. While doing this, don’t put your faith and trust in the individual. Instead, put your faith in God. Believe that He will do what He says He will do. That He hears your prayer. And that you can pray while at the same time be comforted by Him. Third, pretend you’re a duck, a matador, or a turtle! “What?” you might be saying. This sounds a little crazy! I’ve had my own times when I’ve had to stand in faith while people in my life have been “acting out” in not so good ways. Hurtful. Painful. Longsuffering! And it can be very hard to endure for the long haul. So I have developed a few simple ways that have helped me endure – all while trusting in God and praying. Become a Duck: Imagine a duck out on a raining day. What happens? Drops of rain, big and small, fall on the duck. Yet they all just roll off his or her back. The duck doesn’t absorb the water. Rather, the drops just fall to the ground and do no harm. During some of my darkest hours, I would pretend I was a duck. I imagined the hurtful words or unkind gestures just rolling off my back and falling to the ground. Sometimes I would have to “shake them off.” And sometimes it required a lot of shaking. But this little imagination helped me to not receive the corrupted seed into my soul. Become a Matador: Again, tap into your imagination. Think of a matador standing in a bullring with a huge, mean, and powerful bull charging toward him. What does the matador do? He extends his cape, which the bull charges and then passes through. No harm and no impact comes to the matador. The bull just runs on by. 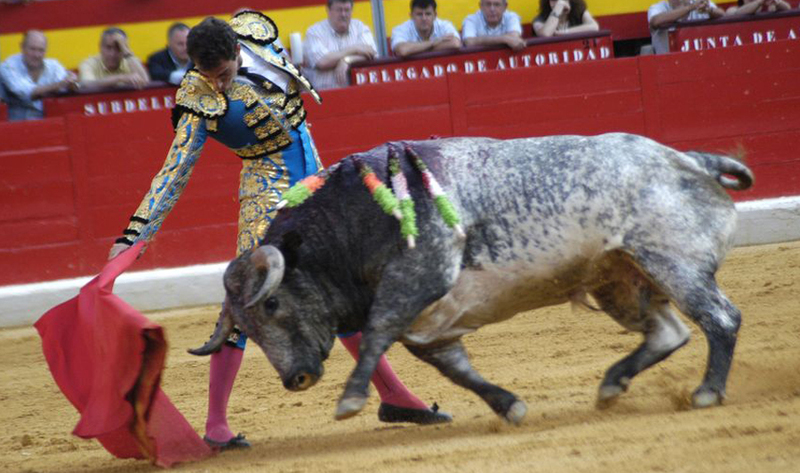 Again, similar to pretending you’re a duck, you can imagine yourself as a matador. The insults can come charging toward you. The “bull” intends to hit you and hit you hard. But you can just let them pass on by! You don’t have to receive the hit. Just stand in your own integrity and faith and let the hit go its merry way! Become a Turtle: The purpose of pretending you’re a turtle is a little different than the duck and the matador. And I used this technique recently. Let me explain. There are times when you are standing in faith or believing for something. You are purposefully and intentionally exercising your authority as a believer and relying on God and His promises. Then someone you know starts sharing their “worldly wisdom” with you. Chip, chip, chip. Perhaps not even knowing it, their words are chipping away at the faith you are using. Their words can turn into doubt in your mind. And where before you were strong in your stand with the Lord on the matter . . . now you have to recover. When I’m in this situation, I take on the role of a turtle. I pull all my soft and vulnerable parts into a shell and become sheltered from the thoughts and opinions of others. I don’t talk about matters with people who don’t understand the ways of our faith. I become quiet and still. Now the great thing about the turtle’s shell into which I retreat is that Jesus is right there with me! I can still talk to Him. I can continue to be in His peace. And He and I can huddle under the shell and wait in faith for the answer and the result. One more thing – when people are being rude, unkind, unloving, or disrespectful a natural (note that word) response is to mirror back the same emotions. But as followers of Jesus Christ, we’re called to behave as He behaves. In love. In patience. In faith. Hold your tongue. Don’t retaliate. And leave the battle to Him! Remember His promise to remain in His peace. I have received so many blessings and knowledge from your teaching. That I thanks God for you. Awe, thank you so much, Zoraida. Our God is so very good. I am a blessed woman to serve Him by serving His people. Be blessed as you continue to grow in the love and knowledge of our Lord. I Thank You for sharing Your gift, I just finished my 21 day fast along with my prayer circle, The Praying Princesses, we all have been blessed Spiritually and physically, as we mature in our walk with Christ. Thank You for Your teachings, they have blessed my life in so many ways, and my family, business, friends as well as myself has been blessed with a Better version of Me!! I’m able to bring Joy into other ppl lives, b/c of my Contentment in Christ, not wanting to figure it out, but Trust Our God, Trusting despite, and that’s just been an opening for other to wonder Who Do I Know!! And a true blessing to Introduce Jesus to others!! A True Blessing!! God continue to Bless You and Keep You!! I am so happy for you. Our God is so brilliant and He’s eager and desiring to share His light with and in us so we can shine to others! You, dear one, clearly are shining! Thank you for your lovely and loving message. I appreciate you! Be blessed as you continue to grow in the love and knowledge of Christ. Thank you for your encouragement. I did the fast for 21 days and even got my cell group doing also. I have had some positives happen that I had been praying for since last year. My daughter got a promotion and an increase in salary, my son and his girlfriend both got jobs to go alongside the other business, they run an online business but monies have become very tight. So I praise Jehovah for his faithfulness. I have separated from my husband since things have been very toxic, and I have been praying and fasting for a long time with no clear answer. I know God will never leave me nor forsake me, but I am longing for answers. My husband, who is a Christian, has got himself in a hole. It’s a long story but he needs deliverance. He will not get help, and until he does I can’t see us getting back together. He speaks to me like I am his foe and has no respect for me. Anyway, I thank God for life, health, family and good friends. Praise God for the answered prayer! And I am so happy that to you know Him, you know His nature, and you have placed your trust in Him. Marriage challenges are so painful. Continue to seek God’s direction and insights. Pray that your husband’s heart will be softened and his spiritual ears sharpened to the truth of the Lord. Be sure to give yourself great self-care as you walk this part of our journey. Stay close to the Lord and know for sure that His love toward you is everlasting! Is sparking water included in the Daniel fast? Yes, William. Be sure it’s free of any chemicals or sweeteners. But if it’s natural sparkling water, then you’re good to go. I have had extensive hurt when it comes to my biological family. I am blessed in that it has not come from anyone living under my roof. My husband and 3 children protect me and we have a very peaceful home which I thank God for everyday. To love humans much is to open yourself up for much hurt and heartache. I am learning to be a duck and take my hurts to the Father. He knows they are there anyway and it helps me to “tattle” on them. I always try to remember that I live for God, not anybody else, and his opinion is the only one that really matters. He loves me no matter what, plain and simple. Thank you, Susan, for your ability to teach us using illustrations we remember because they are unique, but simple to grasp. I have never met you, but I love you! Awe, dearest Tammy, thank you for your encouraging and touching words. As I write this message to you, love is pouring out from my heart to yours. Our God is so good and what a joy to be the love He’s demonstrated to us. Be blessed, dear one. And know that the love of heaven is perfect, never hurtful, and always available to and for you. I’m starting the Daniel fast in two days. I know it won’t be easy. The actual food restrictions, spending time with God, and entertainment restrictions wil not be the difficult challenge for me. My challenge will be my behavior during the fast. I currently have spouse, family, financial, and educational challenges. I have been trying to hold things together but my buttons get pushed in the process causing an unfavorable reaction. I’m guessing those challenges will increase during the fast but I pray not to overreact but to respond how Jesus would. I also pray to be a turtle during this time and that God will shelter me. He is my refuge. It would be great if God would change me, my situation, and bring forth total restoration. One of the most powerful lessons you can gain on the Daniel Fast is submitting even more of yourself to God. Yes, there is the submission of our desires for food, but greater is the submission of our ego and our attitudes. I encourage you to treat this time of fasting like a boot camp where you are learning fill yourself with the Lord and rely on Him. Take up the citizenship you have in heaven, and realize even more that you are a new creation in Christ. Be blessed . . . and put your trust in the Lord. Wow Susan, great read. Thank you for sharing. I am having a very difficult time trying to work through and having patience with a man that I walked away from. I’m praying God is doing things behind the scenes, but just not sure where the outcome will end. I just need to draw close to God, like NEVER before!!!! I’ve NEVER completely put my trust in him & I am trying very hard to do so, while trying to let him heal, mend, restore my broken heart in this process. Please pray for me… I will begin my fast tomorrow, June 1. I have been on a ten month journey of discovering and dealing with the demonic forces that have been at work in my life. I’m seeking freedom and deliverance and death to my flesh. Please pray that I may know truth in the inward parts and complete and total submission to God and His correction. I long to hear His voice. Yes, Patti, I have prayed for you. Remember, the devil is a defeated foe. Learn about your rights as a child of God. Stand against the enemy and his powers. You are so much bigger than He is. Lean into the Lord. Allow the faith of God to fill your heart as you submit to Him and rest in His grace. Hello Susan, Our church just started the Daniel Fast for 21 days until Easter; This is our second year doing this fast. What a difference it has made in our Lives. After the Fast last year, I bought your book to help us during this years’ fast. God is Good, All the time! I am thankful for his mercies. I work for a Bread Company and I discovered only this week that we have a line of unleavened Organic Bread. I would like to send the details to you so you can tell me if it is okay to use. Stay Blessed!! You are an inspiration to us all! Please send the information to support @ faithdrivenlife.com and we can check out the ingredients. If the ingredients are free of leavening agents and/or sweeteners then the bread is likely okay. I would love to know the name of this unleavened bread is! I will be starting my very first Daniel Fast soon and I have many questions about what store bought foods are acceptable for me. Also, Please let me know if “Terra Chips” are ok, since I think they’re very healthy vegie chips with no sweetener or artificial preservatives. The Daniel Fast guidelines don’t allow deep fried foods. It seems Terra Chips are deep fried, so that would mean not ok for the fast. I also encourage you to only eat flatbreads (or no bread at all) during your fast. You can have some tortillas, but most of those you purchase are packed with chemicals. Try Mission Organics White Corn Tortillas. The Bible speaks of if I had a thousand times I could not praise him enough. This Series has blessed me so I have seen God work I have heard God clear and most important God has given me wisdom. Like the statement I just said until now I believed it was scripture the thousand tongues, wisdom from God has showed me that it is a good Christian saying but it is not scripture it is a beautiful song. I do not want to speak good feeling words I want to speak scripture because the word of God is the only way change is going to happen. Good feeling words will not change anything. Thank you so much this says session was free and I was able to participate I am praying and asking God to open doors for me to start the eight-week session Discovery faith and transformation. Again I think God for you Miss Susan continue to be blessed I love you!!! I greet you all in the name of our Lord Jesus. Thank you Susan Gregory for the amazing message by online video and short questionnaires. It’s really an eye opening revelation truth journey and I would have liked my other brothers and sisters to also follow through on this journey in faith. Is there anyway I can purchase the whole 21 day series in Oder for others to join in the fast later in the year? The Daniel Fast book has a 21-day devotional in it. I have organized (or tried my best) to get as many as possible to do a Group Fast, which we are doing right now…about 35. 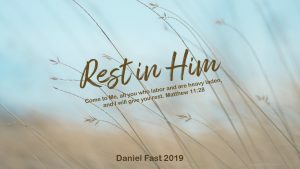 I will be leading our church for a Lenten study, doing the Daniel Fast again, and planning on doing the last 21 day of lent, March 26 – April 15th. We will be using the Daniel Fast Workbook, I’ve never used it before. 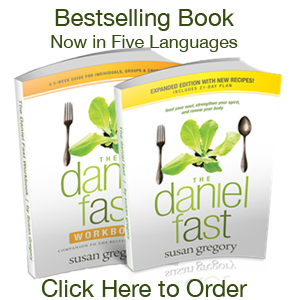 I am assuming each person needs a Daniel Fast Workbook? Also I was a little confused on when our first meeting should be. Will be meeting on Wednesdays, so the book said we should do the lesson 1 week in advance. If we start the 1st study March 22, should the books be given out on March 15th, to give them 1 week to do the study? Just want to make sure I understand it right? Thanks for all your prayers and support! Thanks for that message it was Well stated. As human we tend to want to retaliate but I recently started to try to hold my tongue and think on what Jesus would want me to do. It’s all about change on my part and not dwell on what the other person have done or did. God is faithful in all, we need to trust him more. I know it’s hard more is not impossible. Thank you Susan. I like the part where you say, when retreating into the shell, Jesus is there with me and we cuddle. I imagine Him whispering ” All is well my child. ” thank you. This is my 8th day the first time of Daniel fasting and I know my life will never be the same after the 21 days is over. I have all the Faith it will be so. Susan today I have been blessed. For years I have been all 3. However I have decided that the family member apparently gets worse. So with the help of God I have to take this person outside of my safety zone and make the law speaks. I understand all what you are saying but my problem is that I had all the accusing words and then silence. For 9 mths my daughter and my 5 grandchildren have not spoken to any immediate members of our family. This has being going on for 12 years and every time she has rung up to renew our relationship but not this time so far. In other times I have asked her what it is that causes this and she just says she needs space. I know God is good all the time and I cling to that. Her silence is very loud! My prayer is that God’s Holy Spirit will encourage your daughter’s heart and that love, forgiveness and understanding would take the place of hurt, resentment and any bitterness that may be there. I encourage you to pray for your daughter and your grandchildren. Love them, with no strings attached, from a distance and give the whole burden to the Lord. Jesus came to heal the broken hearted. Have faith in Him. I have been blessed for a couple of years now by your book and I have passed it on to friends in dire need with great results. I too am suffering right now with a difficult family situation but with God holding me up I cannot lose. This year’s fast is crucial for me. Be totally covered in His love Susan you are a great soldier in the fight. Yes, we have challenges in our lives. And praise God we have a loving and caring Father who holds us and supports us. Cast your cares of Him for He cares for you. For me, there have been times when I remind myself of that benefit many times a day as I walk in the dark valley. And even though I am a grown woman . . . I still sometimes imagine myself climbing up onto the lap of my Father so He can hold me and comfort me. He’s there for you in the same way. Be blessed and Happy 2016! It’s always amazing how God works! My sister was encouraging me to try the Daniel Fast with her this year (she does 1-2 per year) and I decided to visit the website and ran across this blog. This particular blog message was exactly the reminder I needed and gave me guidance. If I’m being honest, the thought of praying for the one who hurt me is daunting and my flesh responded “no way”! But I want to be obedient and I want to stop carrying bitterness and anger so I wlll try it. Thank you Susan for posting this! I totally understand your challenges. I’ve been there, also. With God’s grace and allowing Him to work on my heart I have been able to forgive.